But Jon Olsson isn't your standard Lamborghini owner. 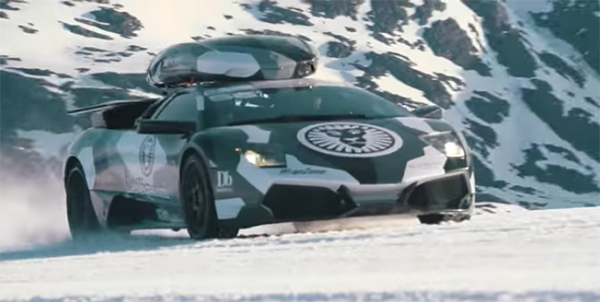 Olsson who is professional freestyle skier and has quite the collection of performance vehicles (mostly Audi and Lamborghini) decided to take his Murcielago up a glacier. The idea of doing this is ridiculous in itself, but Olsson's Murcielago has been converted from all-wheel to rear-wheel drive. To give the Murcielago a chance of succeeding, a set of studded tires were fitted. Judging from the video, the Murcielago has no trouble climbing up or sliding around in the snow. Also, the roar of the 6.5L V12 sounds incredible. To get back down, Olsson decided to run the vehicle through an impromptu downhill ski slalom. It doesn't quite top the time he drove Rebellion R2K prototype up a ski slope, but it comes very close.